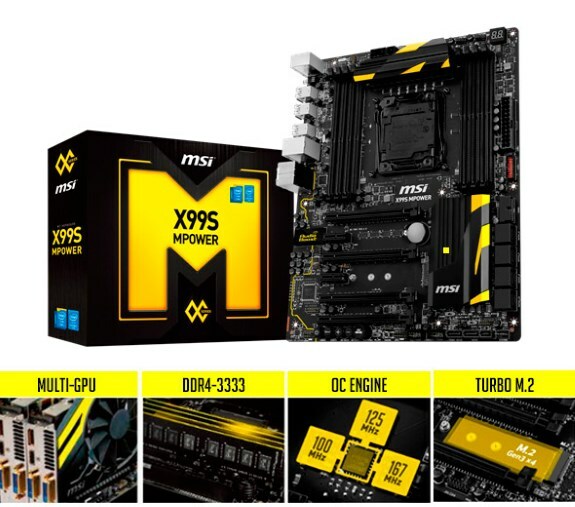 MSI, world leading in motherboard technology, is pleased to announce its release of the MSI X99S MPOWER motherboard. After MSI launched its X99S XPOWER AC motherboard on August the 29th it’s now time for its brother, the X99S MPOWER motherboard, to assist in dominating the benchmarks. The MSI X99S MPOWER is a custom designed overclocking motherboard, specifically for enthusiasts demanding the highest performance and the best stability while still getting a ton of OC features. The MSI X99S MPOWER motherboard is ready to take the new 8 or 6 core CPU’s and DDR4 performance to the limit, proven recently by already breaking 26 records during the finals of MSI’s overclocking contest, MOA 2014. OC Certified and Military Class 4 components make sure it can handle anything while retaining absolute stability. The next generation OC Engine helps to push the system to its limits with more flexible bClk overclocking, needed for breaking records. The MSI X99S MPOWER also comes with Quad Multi-GPU support, OC Essentials, Turbo M.2 32 Gb/s, SATA Express, Audio Boost and Intel Gigabit LAN. After generations of proven world class overclocking performance, MSI is proud to add the X99S MPOWER motherboard to this record-breaking MPOWER family. It’s a motherboard truly built for overclockers, by overclockers. Built with Lightning DNA and Military Class 4 components, MSI’s OC Certified models ensure stability and top overclocking performance with the latest Intel HEDT CPUs. This has already been proven during the latest MOA 2014 event in the Classic and NO LIMIT Grand Finals, where the X99S MPOWER motherboard was used to break 26 record on HWBOT. Clever solutions are once again handed to enthusiast overclockers to help break world records. Featuring a large number of convenient overclocking tools such as V-Check Points 2, CeaseFire Lite, Go2BIOS and DirectOC buttons for realtime overclocking, the X99S MPOWER motherboard is ready to push your hardware to its limit. OC Certified is a military class burn-in test for motherboards. Running Prime95 for over 24 hours with a highly overclocked CPU is already a stressing endeavor, but removing all airflow from the motherboard ensures that only the best motherboards survive. If a motherboard can survive this, it can survive any overclocking situation. MSI Overclocking motherboards are equipped with all the necessary features to make sure you get the most out of your system. From the Enhanced PWM with a large amount of power phases and Thermal Design that give you the best stability, to all the easy features that ensure that you don't have to perform a lot of tricks to get great stability in your quest for performance. The MSI X99S MPOWER motherboard features a next generation Clock Generator for more flexible BCLK adjustments, from 100 / 125 / 167 MHz straps. Using these straps prevents system crashing while overclocking on the edge and opens doors to achieve the absolute maximum. The next generation chip offers even lower jitter and power consumption resulting in even higher stability under the most extreme conditions. Delivering speeds up to 32Gb/s, Turbo M.2 is more than 5 times faster than a regular SATA III connection. Turbo M.2 32 Gb/s is the successor to M.2 10 Gb/s, offering performance up to 3 times as fast using PCI Express Gen3 x4. M.2 is packed in a small form factor and is compatible with 3 different sizes to fit most storage solutions. Gamers can enjoy a blazing fast system boot up and loading of applications and games.